There’s something wrong with Cate Gardner. 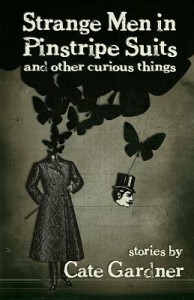 If you don’t believe me, try reading Strange Men in Pinstripe Suits. Clearly, something in her imagination is connected backwards or upside down or inside out. Yes, that’s it – something in her brain has been connected inside out so that all the bizarre, twisted thoughts normal people keep trapped inside their skulls come leaking out onto the page. It’s the only explanation. The twenty four stories in this unsettling collection are some of the most deliciously skewed stories I’ve read in some time. In his introduction, Nathaniel Lambert likens Cate Gardner’s writing to Lewis Carroll and that comparison is probably apt. You can never be quite sure what you’ll find when you turn the page and almost every story seems to have its own brand of sinister undercurrent. Even the stories where the sinister is front and center have another layer of sinister underlying the first. My favourite stories were Cold Coffee & Curious Things (a dark tale of a girl called Alice and the mysterious visitors that keep dropping by the hospital room she’s trapped in), Parasol Dance with the Chalkstripe Man (a girl auditions for a high wire act in a circus) and The Moth Brigade (a robot firefighter and the last human firefighter team up to take on…well you’ll have to read it). I do recommend you read this book one story at a time. Read a tale, then let it skulk around in your subconscious for a while – see what it dislodges. 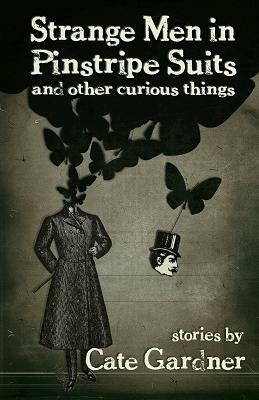 Strange Men in Pinstripe Suits is a very refreshing collection of weird fiction and I’m looking forward to trying Cate’s latest book – Theatre of Curious Acts.